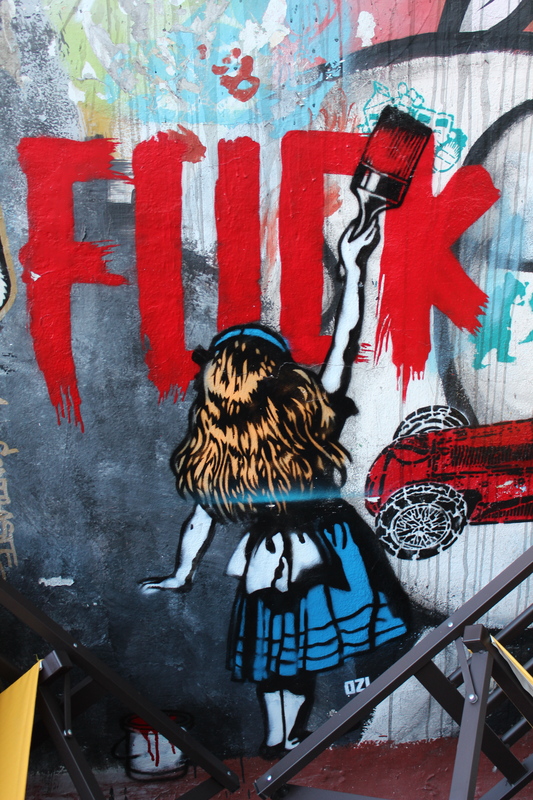 When you think of “graffiti”, especially in the US, most people think of delinquents and vandalism. I personally always think of the opening theme of Fresh Prince of Bel-Air which shows Will being a delinquent and getting caught tagging a wall, one of the acts that sends him to California. In public health neighborhood studies, graffiti is considered vandalism and is counted as something that makes the neighborhood bad to live in. 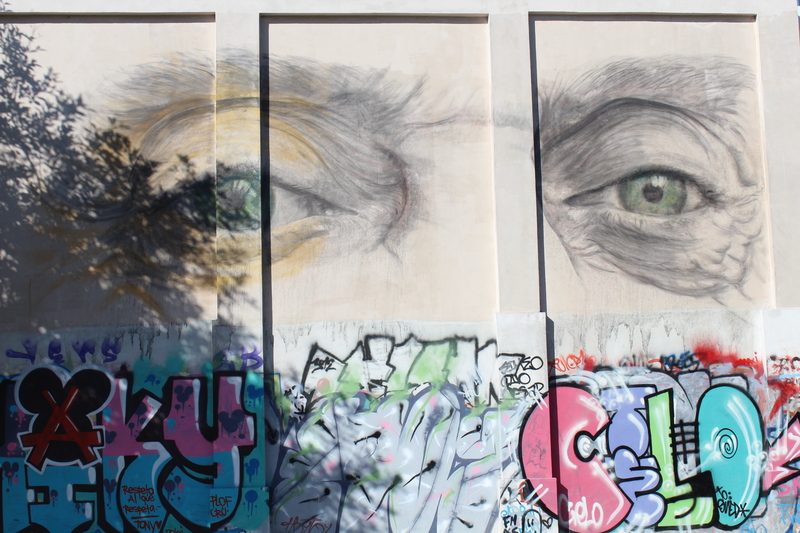 But, perhaps, if we turn it around and think about it a little bit differently, we may think about graffiti more as art than as a delinquent act. 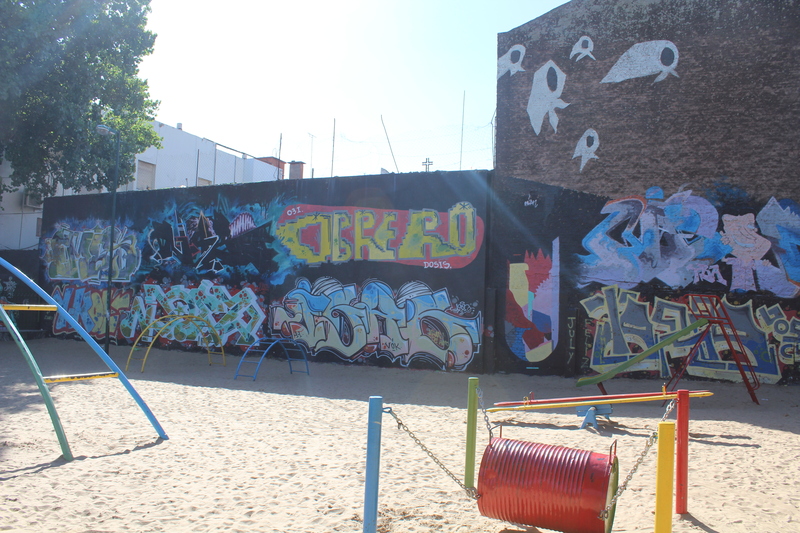 Perhaps if we can think of the graffiti in neighborhoods as a means of venting frustration (or any other kind of emotion like all art), as the outcome rather than the cause of a bad neighborhood, we may be able to sympathize a little with those making the marks. 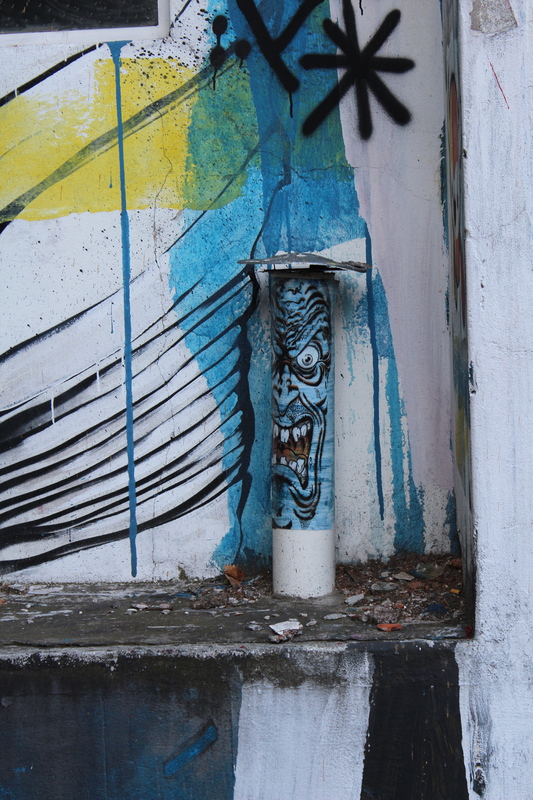 That’s exactly how graffiti and street art are viewed in many countries where the origins were not in gang rivalries. This is especially true in Argentina where graffiti and street art are seen as a viable form of expression of its citizens who went through an awful dictatorship that repressed any form of expression and that kidnapped and killed thousands of people who only hinted at speaking out, and then years later who experienced a crippling economic crisis that would put the most professional of people out on the streets searching through the trash for anything salvageable. After the dictatorship was thrown, the walls of the city became a sanctuary for everyone, a place of conversation, a place where everyone could freely express their opinion or feelings for the whole city to see without fear of repercussion. 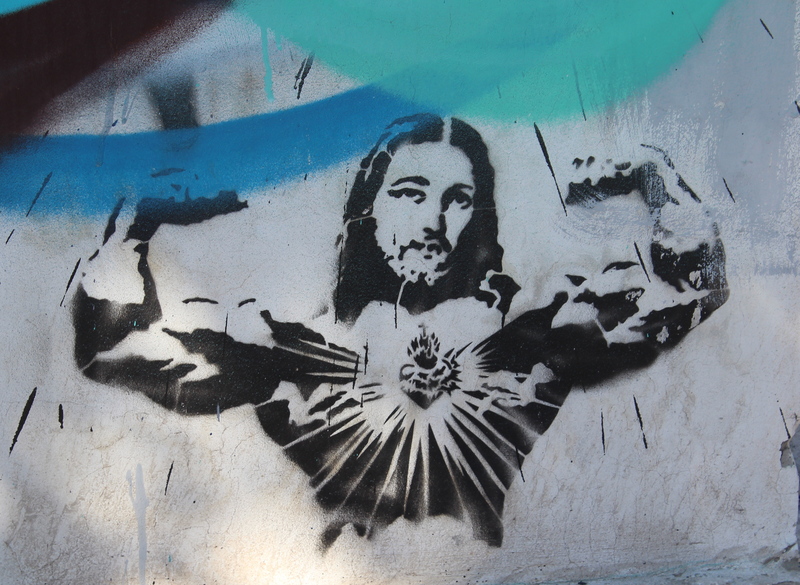 There is a growing movement here and around the world that is allowing graffiti and street art to be seen more as an artistic expression than as vandalism. 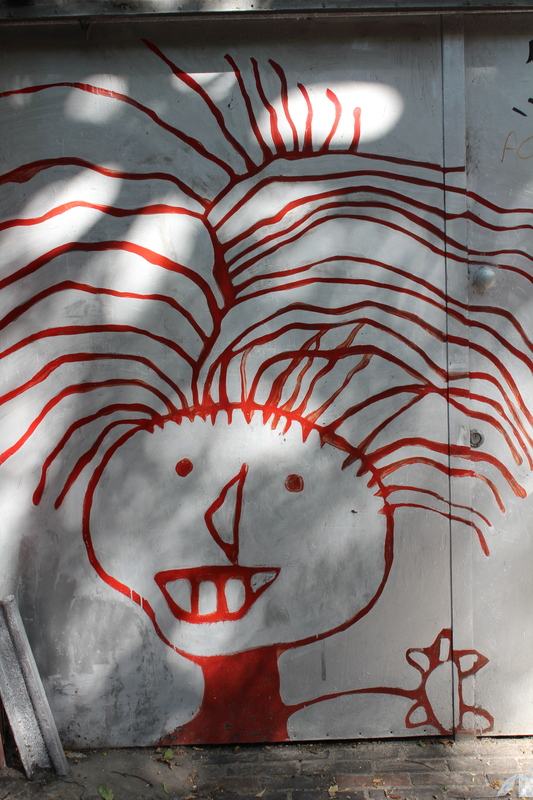 Incidentally, what I thought was funny about the Buenos Aires history was that a lot of the early graffiti here was done by middle-class kids whose moms had bought their paint. So nothing really thug about that. 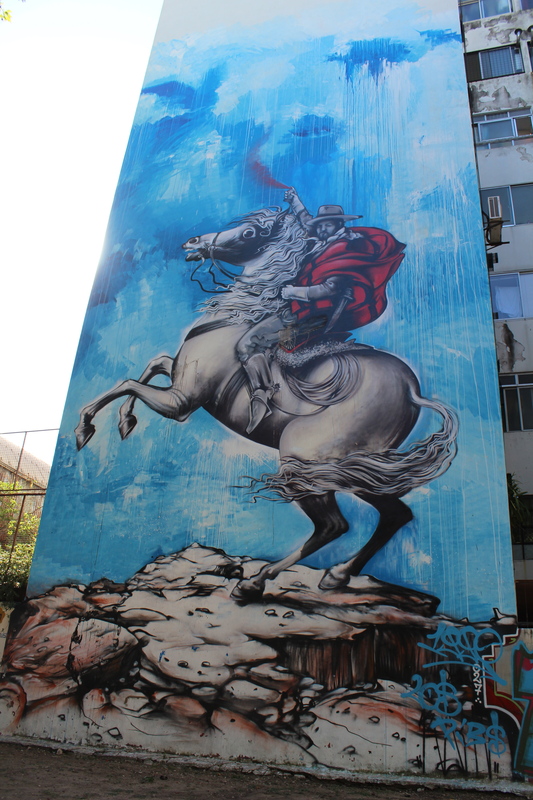 The opinion of street art is so different here that most of the murals will even have the artists information including their website and sometimes their phone number so you can get ahold of them. 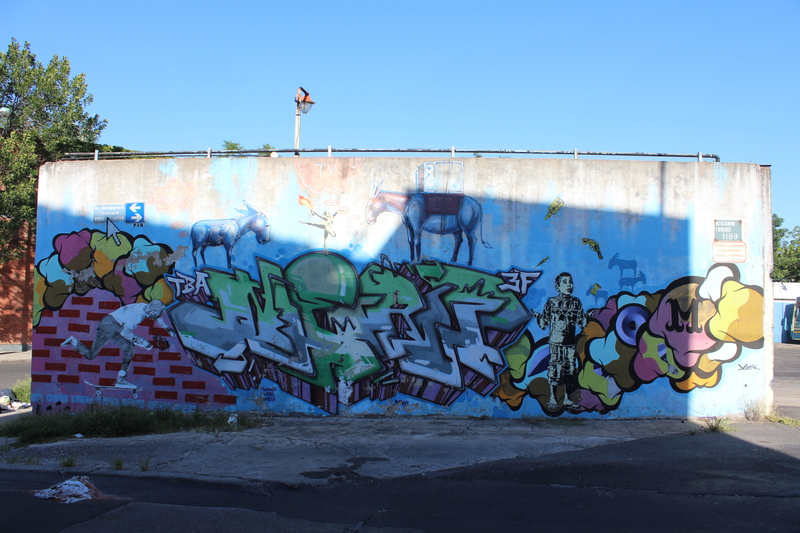 Almost every free wall you look at in Buenos Aires has some kind of graffiti or art on it ranging from small little tags to huge murals. 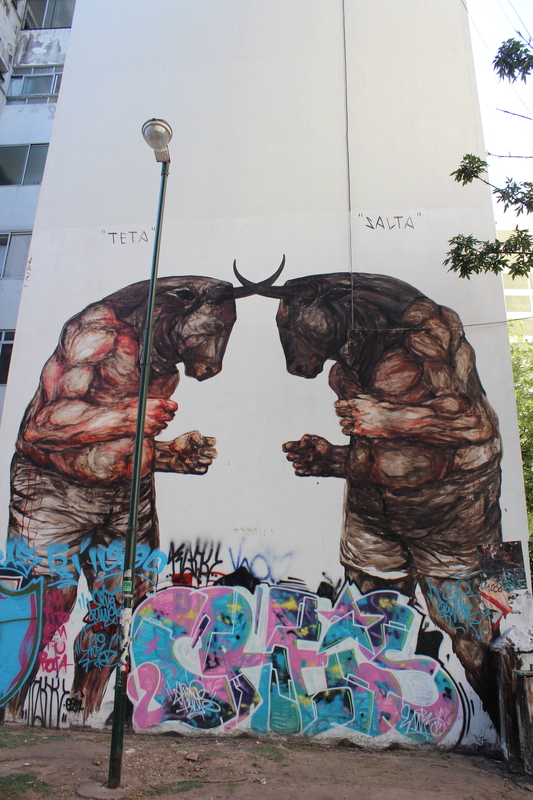 To get a better background on the world of street art in Buenos Aires and on some of the more important pieces, we took a tour with Graffiti Mundo (http://graffitimundo.com/). 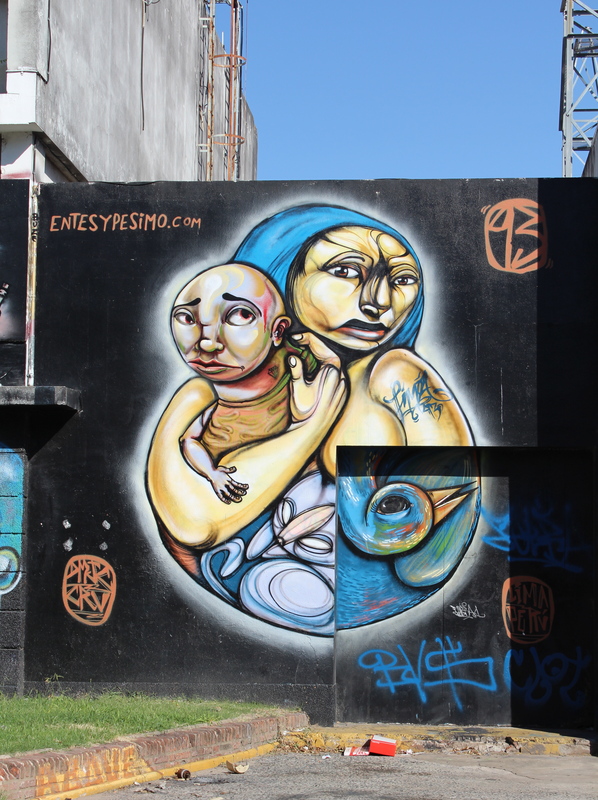 It’s a really great group that was created by artists to support the artists of the graffiti and street art world in Buenos Aires and to educate the public on street art. 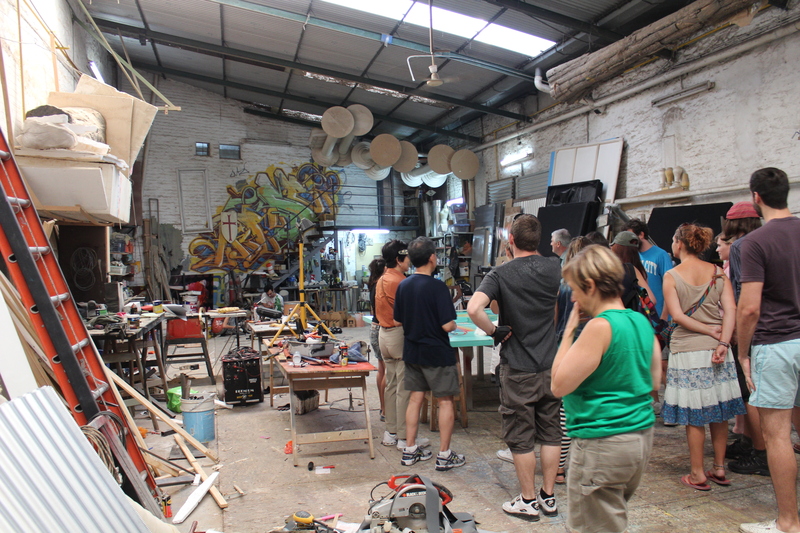 They give tours and support a gallery and are now working on a documentary about street art in Buenos Aires. I’m really excited to see the final project when it’s finished! Anyway, we took this really great tour and get to share some the background and art with you. We met up in front of this house. 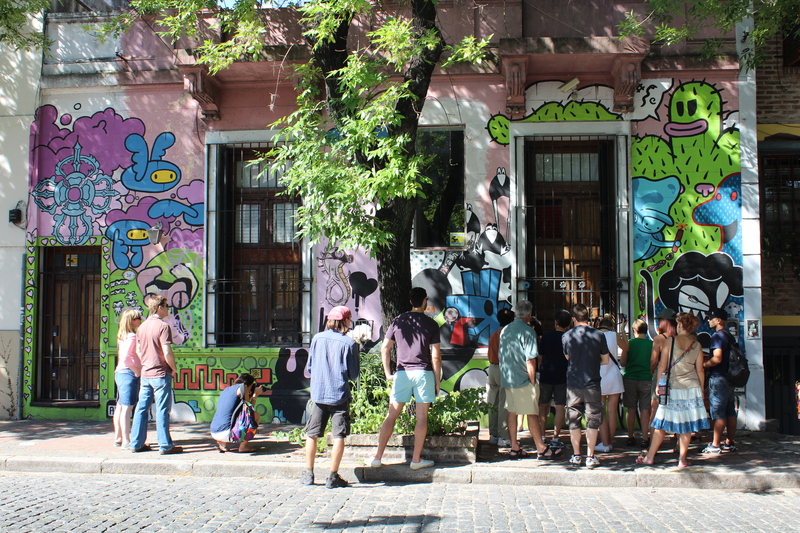 It’s a private residence owned by an artist who, one day, was having an asado (BBQ) with his friends, many of whom were artists (graphic designers, muralists, architects), when they decided to paint the outside of his house. They all worked on it together and each artist (about 10) did a little section. el eternauta is one of Argentina’s most important comic books. It depicts an apocalyptic future in Argentina after an alien invasion and a deadly toxic snowfall. The series started in the 50s but was revived in the 60s and then again in the 70s during the Dirty War when the dictatorship in Argentina grew more powerful and life became more difficult. During this time, the content of the comic became inherently more political and eventually was noticed by the government. When they finally realized the strong political commentary, the government kidnapped and killed the author of the book along with some of his children. The man on the cover, wearing a protective suit, is el eternauta. In the 90s, after the dictatorship was overthrown, those responsible for the kidnappings and murders of the desaparecidos were given protection against prosecution. It wasn’t until Nestor de Kirchner, former president and husband of Cristina de Kirchner, became president in 2003 that those responsible were brought to justice. (The Kirchner governments, both Nestor’s and Cristina’s, have championed the fight for the desaparecidos.) At one event, before the death of Nestor de Kirchner, the wife of the author of el eternauta got up on stage with Nestor and praised him for all that he had done to bring the guilty parties to justice and to find peace for all the affected families. 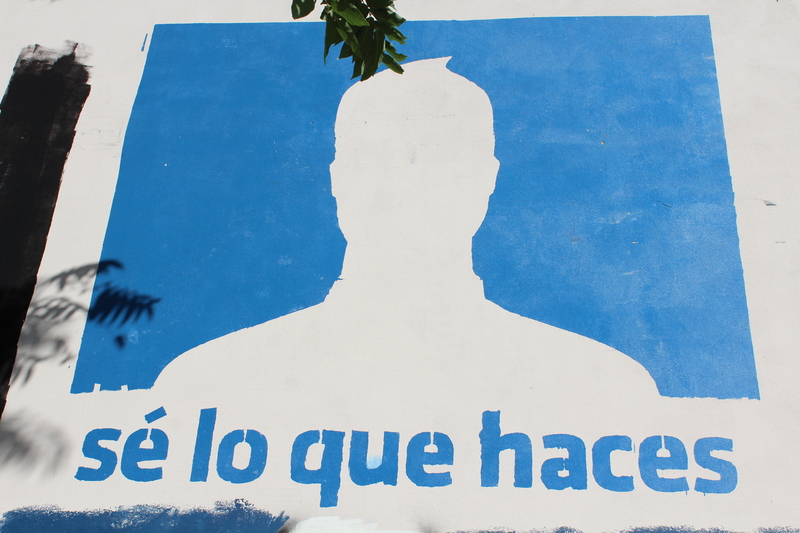 The image above, a stencil, is the figure of el eternauta with the face of Nestor de Kirchner. It’s a very famous image that can be seen around the country and is now used by the Kirchner government in political campaigns. 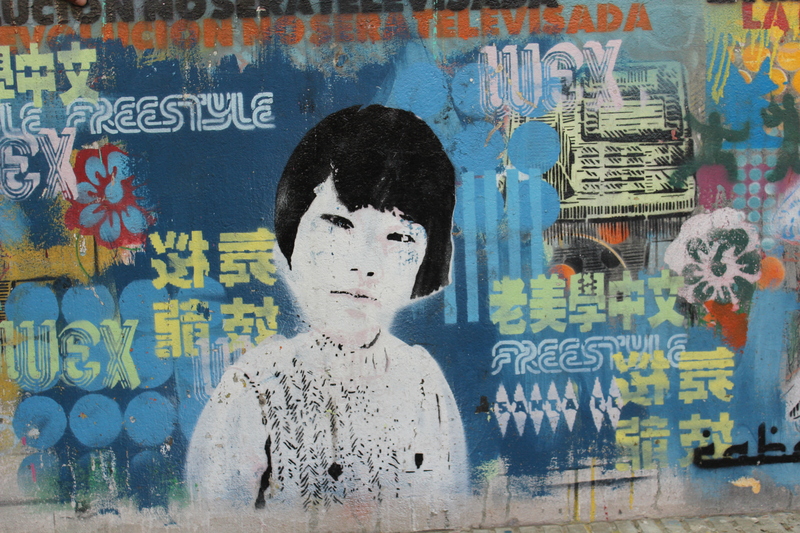 This mural was commissioned by the owner of the building after he saw the artist, Gualicho, working on a heavily trafficked and very dangerous bridge around the corner. 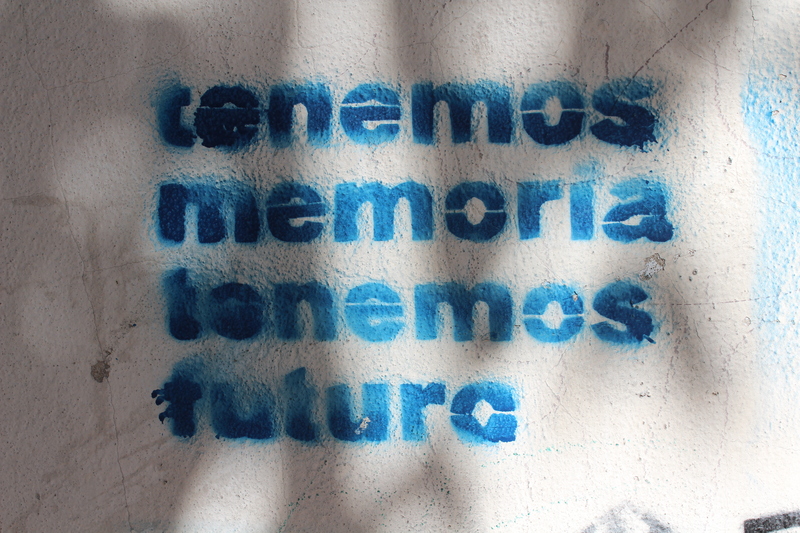 “We have memory, we have future” Stencils are used a lot in graffiti. They are popular because you can make a stencil in your home, which, depending on how complicated it is, can take anywhere for an hour to three months to make. 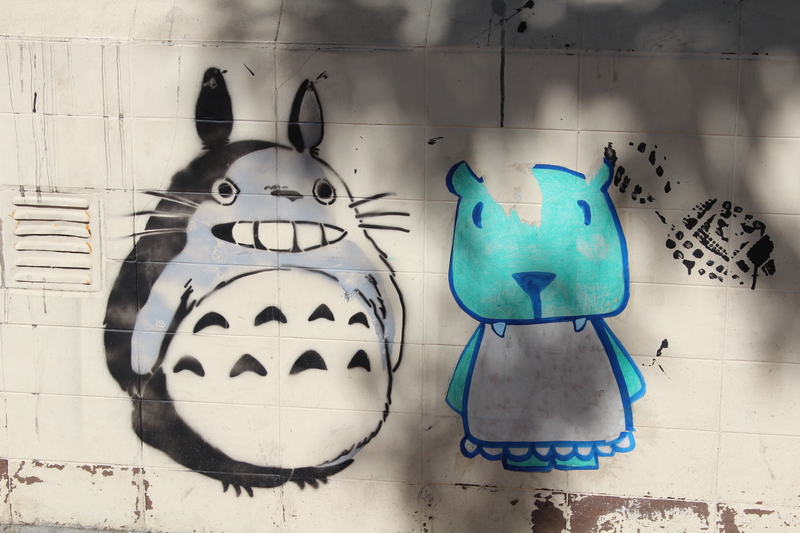 But then once you get out on the streets you can slap the stencil up and have your art up in 5 minutes or so. It makes it easier to spread your message quickly. Also, you can see a lot of the stencils are a certain smallish size. This is because back when they were first starting to make stencils, the artists needed something cheap/free to work with. They found hospitals throwing out x-rays which ended up being perfect to cut and use for stencil work. These are two characters from a Japanimation film that is very famous and, apparently, very beautiful. I’m sad I don’t remember the name, though perhaps someone can enlighten me. 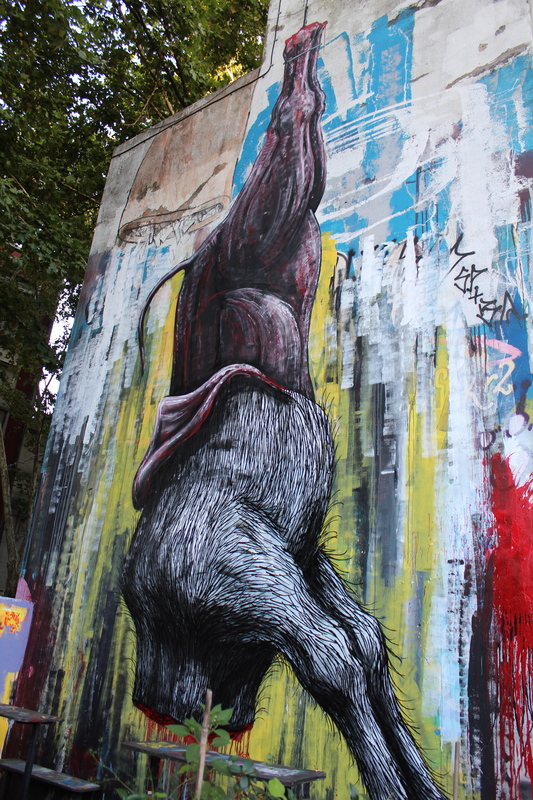 Not all street art is a political message. Some is merely sharing an emotion or something they love with the world. This guy is just kooky and fun. It’s like he’s saying hi to all the passersby. This man writes messages to his children all over the neighborhood. 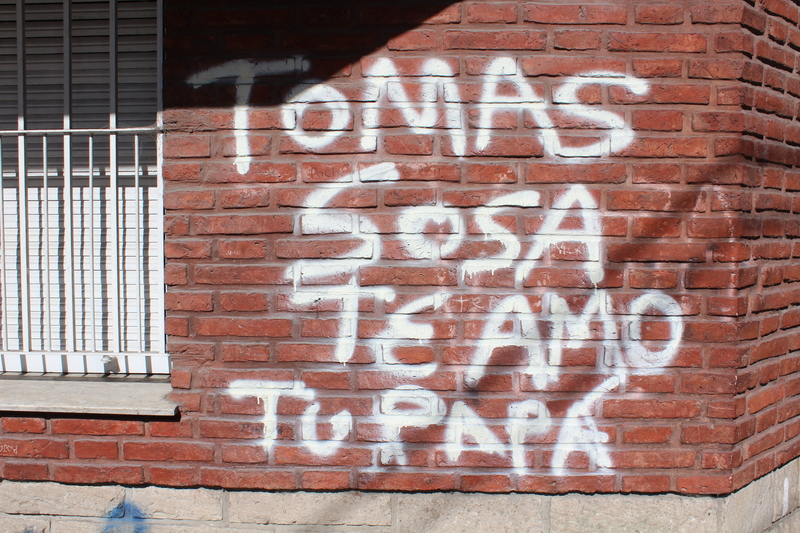 This reads “Tomas Sosa I love you, your father”. The Meeting of Styles is a graffiti festival that brings together graffiti and street artists from around the world to paint on walls in cities around the world. 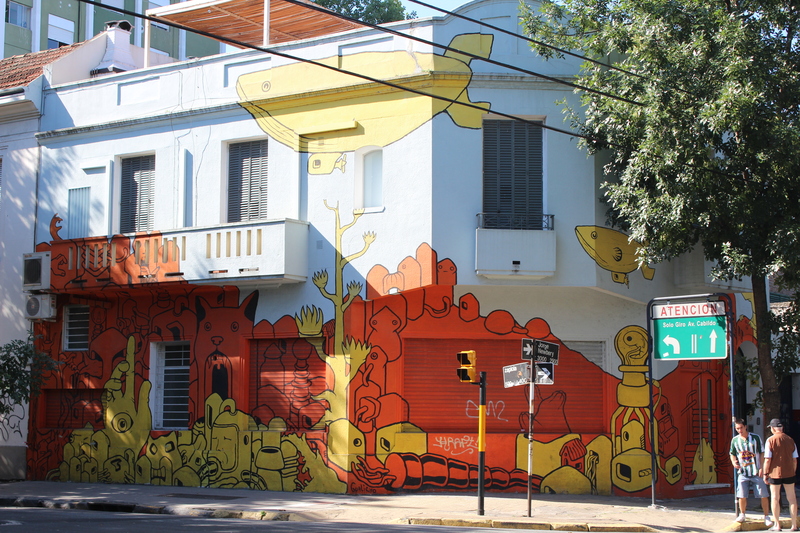 In Buenos Aires in both 2011 and 2012, the festival included over 130 artists, working independently and together, who decorated the sides of apartment buildings, the electrical plant in Colegiales, and the Mercado de las Pulgas, among other spaces. 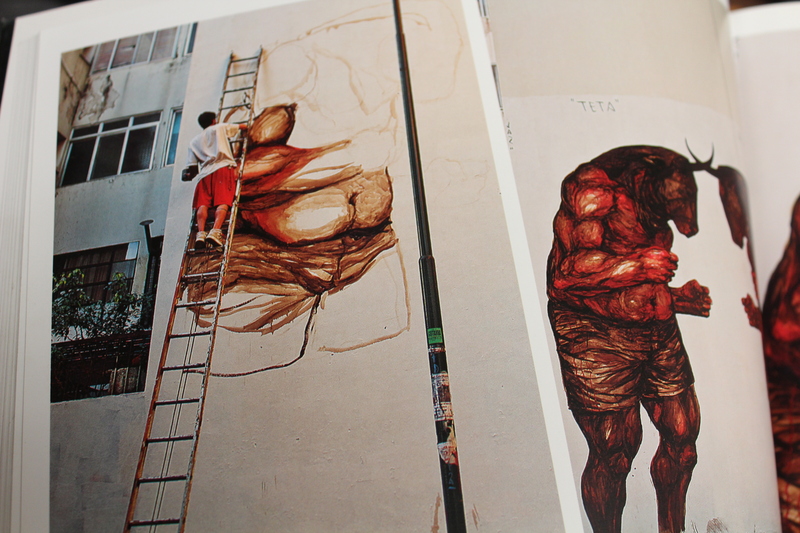 A picture in a book of Jim Vision working on his piece. 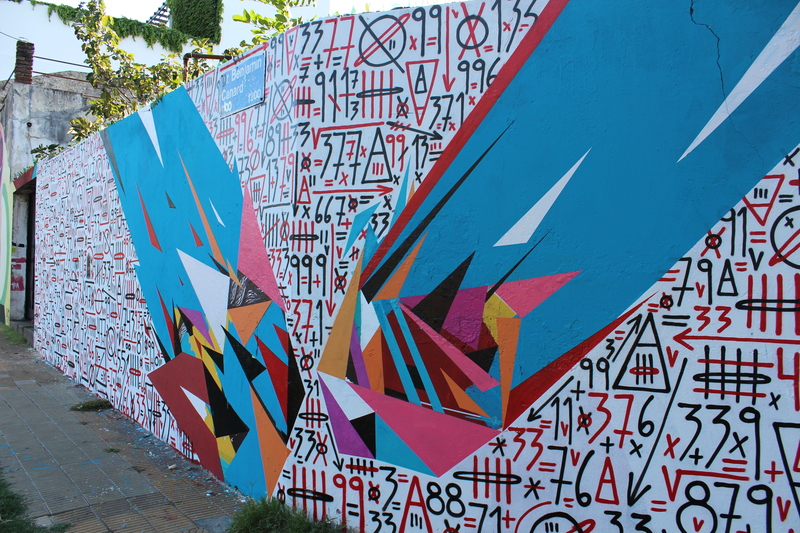 The artist, Jaz, asked the local residents if there was a story they wanted to tell. They told him about the unsolved murder of two neighborhood boys named Teta and Salta. Jaz working on his piece. The white head scarves on the top of the building represent las Madres de la Plaza de Mayo. Long story short – during the Dirty War, the mothers and grandmothers of the people who had gone missing started to congregate in the Plaza de Mayo, the plaza in front of the Casa Rosada. They wore white head scarves with the names of their children embroidered on them and marched around the plaza every week. Although the founding mother was taken, the other mothers continued to march in protest and, in an era when a comic book writer couldn’t even speak out, these mothers became a very public commentary against the actions of the government. The original mural from the festival was supposed to cover the whole side of the building on the right, covering the white scarves, but all the artists decided to respect las madres and keep the white scarves untouched as part of the whole. 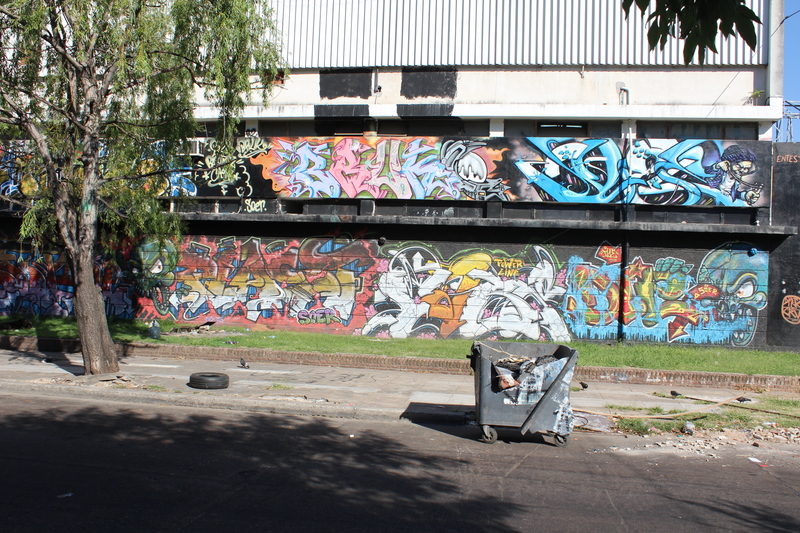 Various artists, behind the electrical building. “We know what you do.” It’s creepy because it’s true. the Google logo could be up there too. 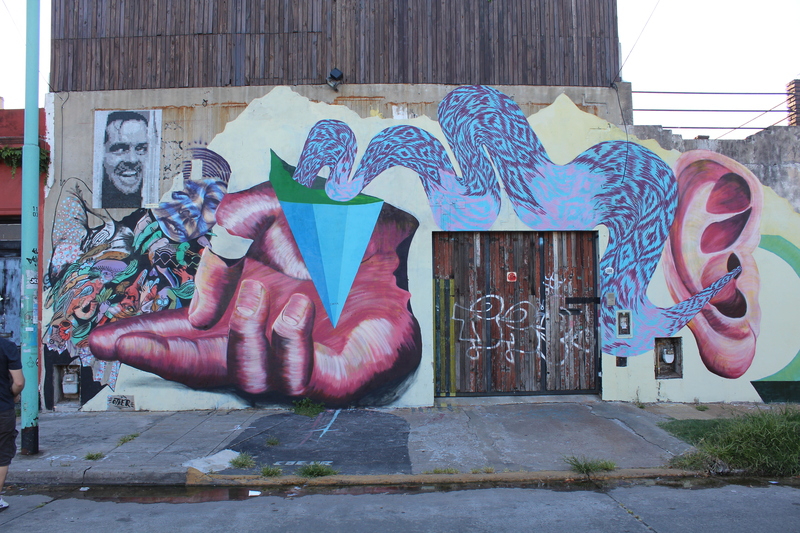 This mural is a memorial to the artists father in law, who died just before he came to Buenos Aires. It is also the first time the artist has used color in his work. It’s amazing because this has now been up for 3 years. Some secret messages to other artists written in korean or scratched in the wall. 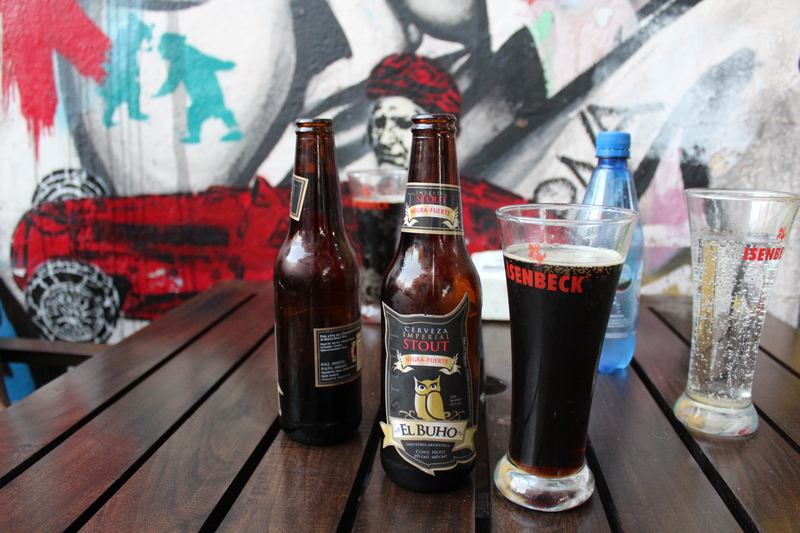 Chacarita is an older neighborhood south of Palermo Hollywood and Colegiales. A bus depot there provides a great source of walls to be covered. 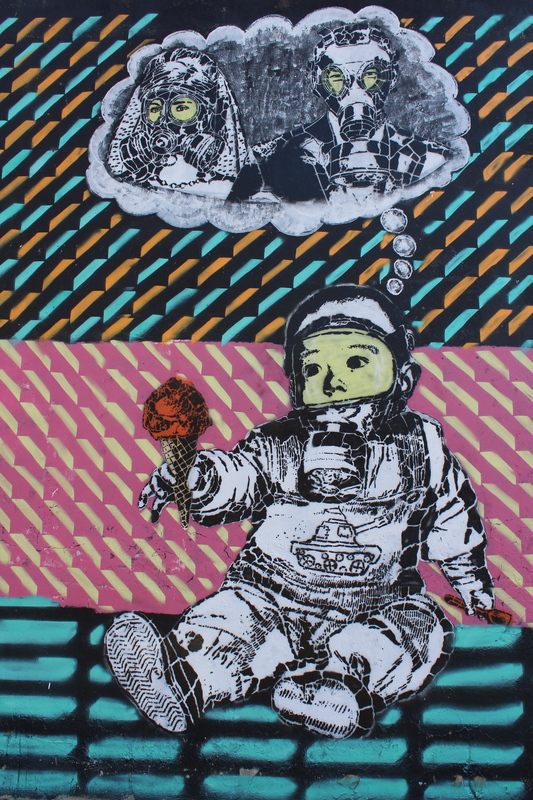 Another aspect of street art is the incorporation of the unique aspects of the wall making each of these pieces unique. I think this is my favorite piece. The way he uses the materials here, a style like some of his other pieces, it looks like watercolors. So beautiful. Artist, Jaz. We had the opportunity to stop in on Jaz whose work you see above. He shares this space with a couple other artists. Franco Fasoli, aka Jaz, was kind enough to answer some questions for us. 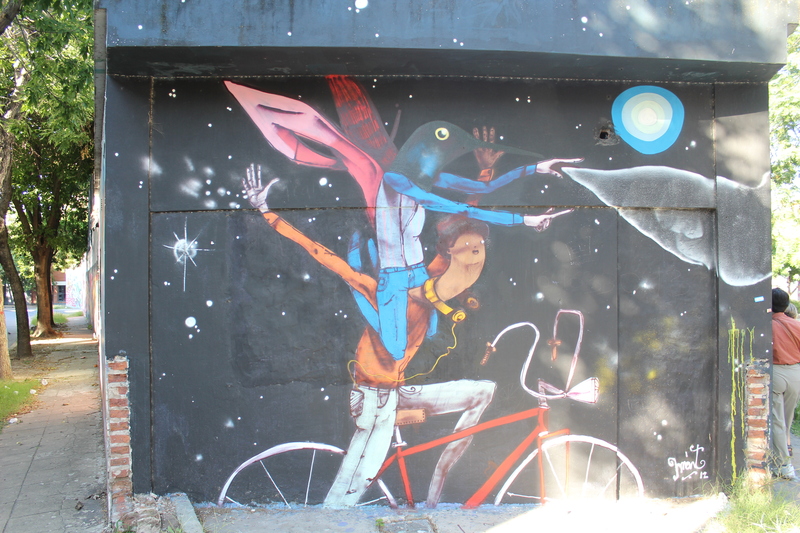 He has an interview with Buenos Aires Street Art. 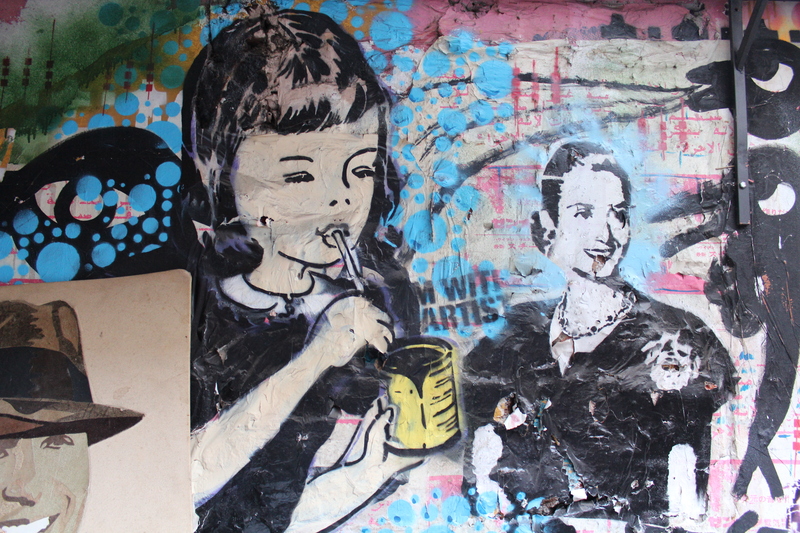 Hollywood in Cambodia is a street art gallery and store located at the back of the Post Bar in Palermo Soho on Thames street. 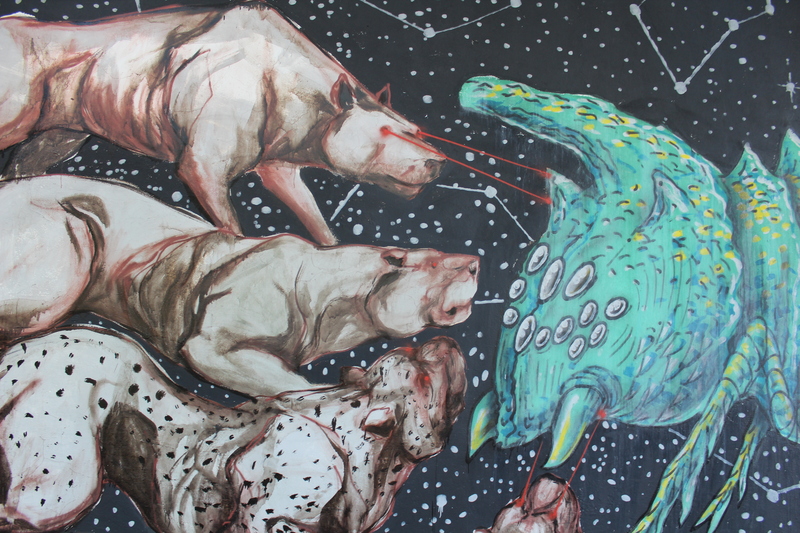 All the artists in the gallery must be currently painting on the streets and much of the art is available for purchase. 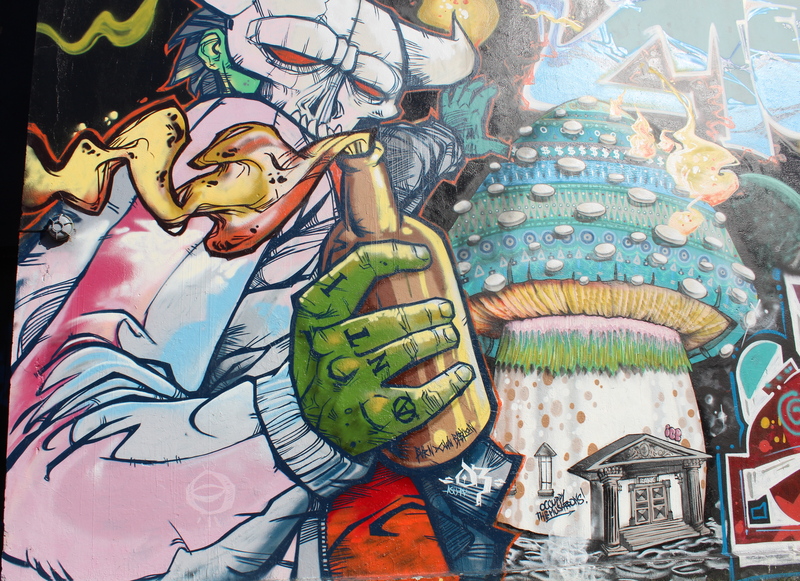 They have a roof deck with walls covered in art. 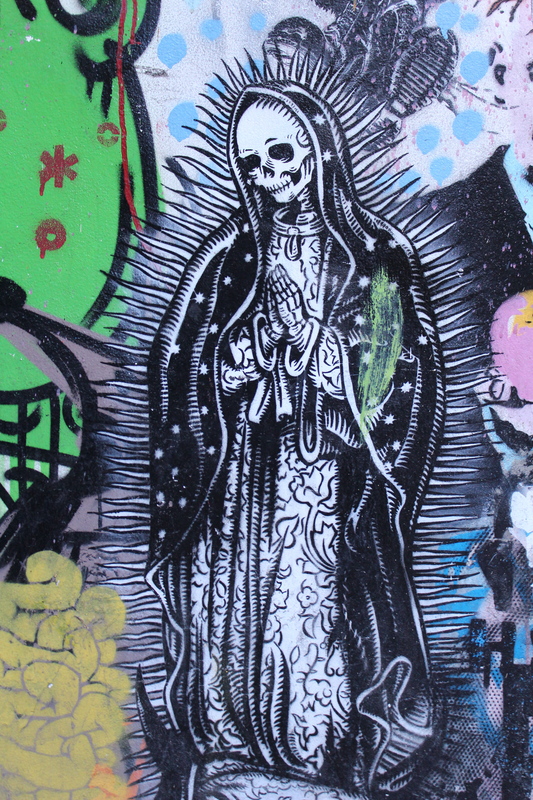 This is a stencil. Imagine cutting out each of the little holes where the black pokes through… crazy. We grabbed a beer after the tour at the Post Bar. 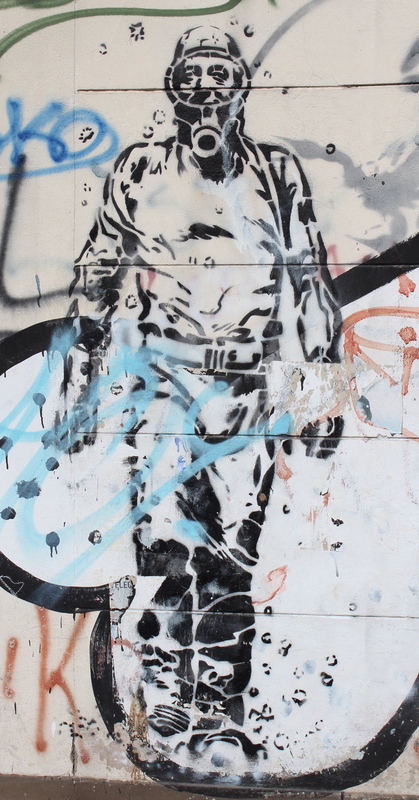 What’s the difference between graffiti and street art? Simply put, graffiti art is created using spray paint and street art is created using some other medium. 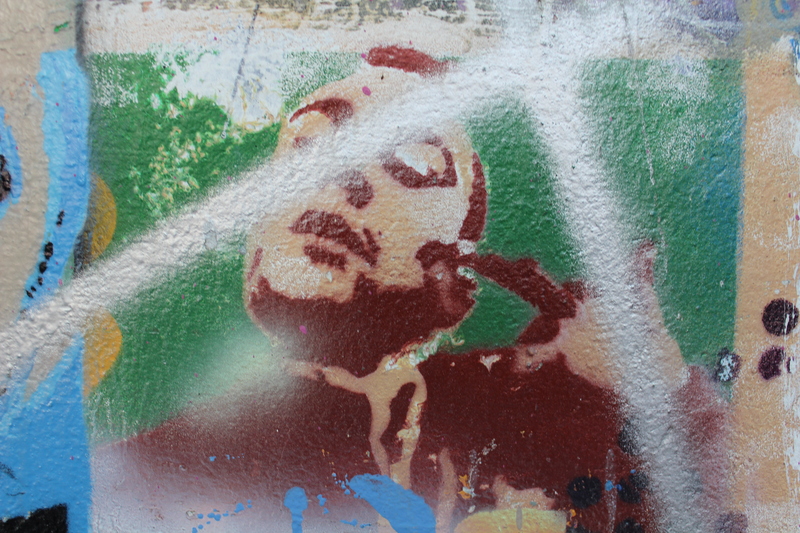 However, apparently if you ask a random artist if his art is graffiti or street art, you may be surprised at the answer. As they usually do, the lines often blur, but the spray paint thing is usually the identifying factor. That being said, some artists are so talented with spray paint that you can’t tell it’s sprayed. Also, there are sometimes differences in the subject matter. A lot of the “classic” or “old school” graffiti art are the names painted with shading, melding together in designs that you can barely read what they say. 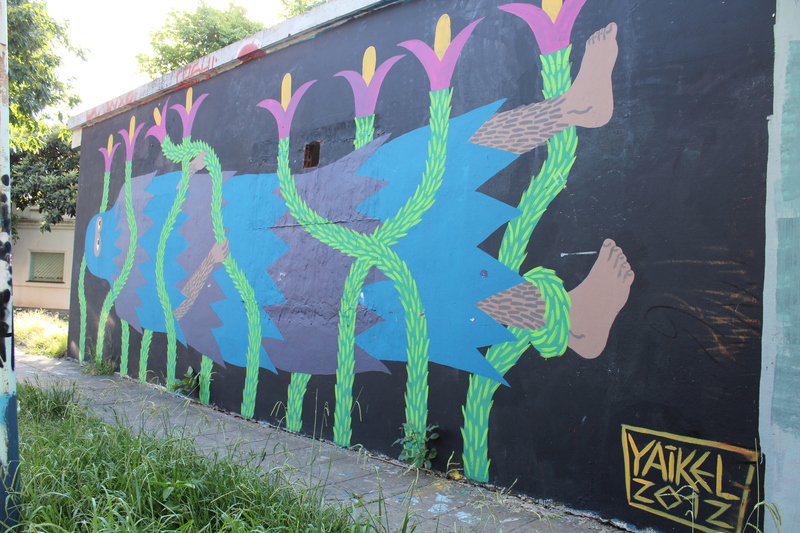 Some of the street artists, like Jaz, consider themselves muralists. But isn’t it illegal to paint on private property? 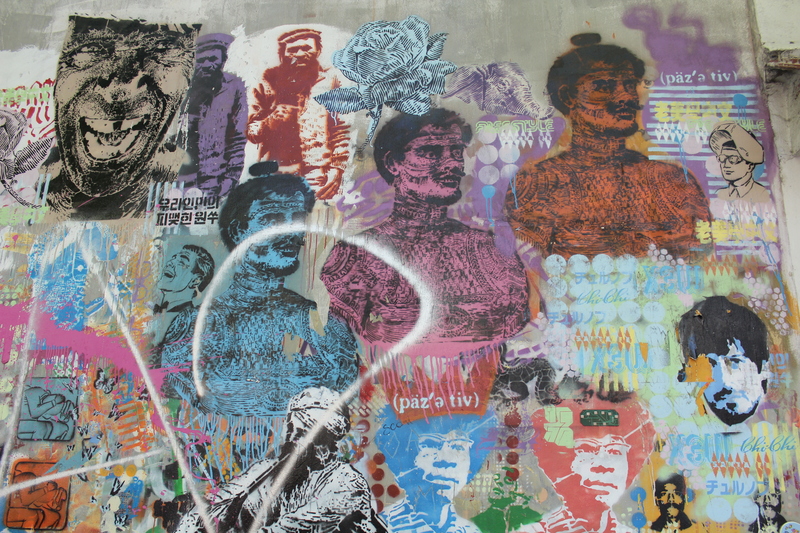 Technically, it is legal for graffiti or street artists to mark a wall without the permission of the owner. But because of the history of the art and the country, most people here do see it was a form of expression and, again given the previous consequences of free expression, don’t really have a problem with it. Even politicians have taken to the streets painting their slogans on walls (which EVERYONE actually hates). 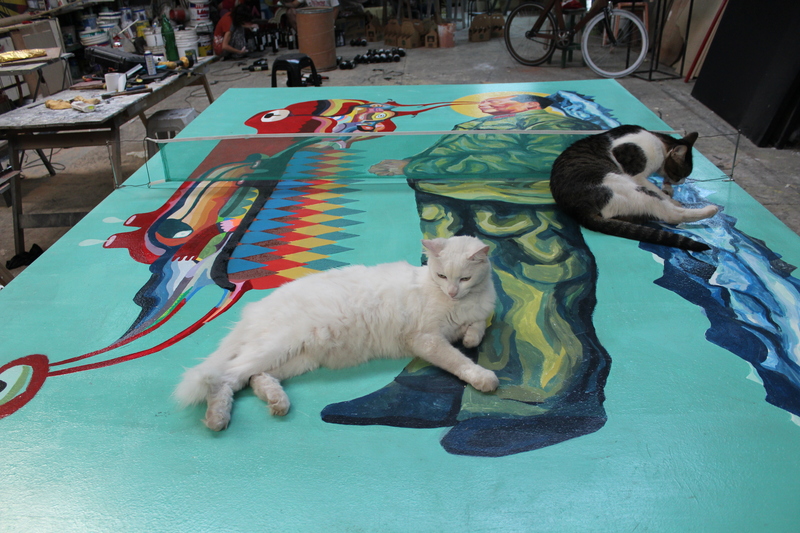 Many times large murals are commissioned by someone or even stores will commission an artist to paint their metal store front cover or garage door. 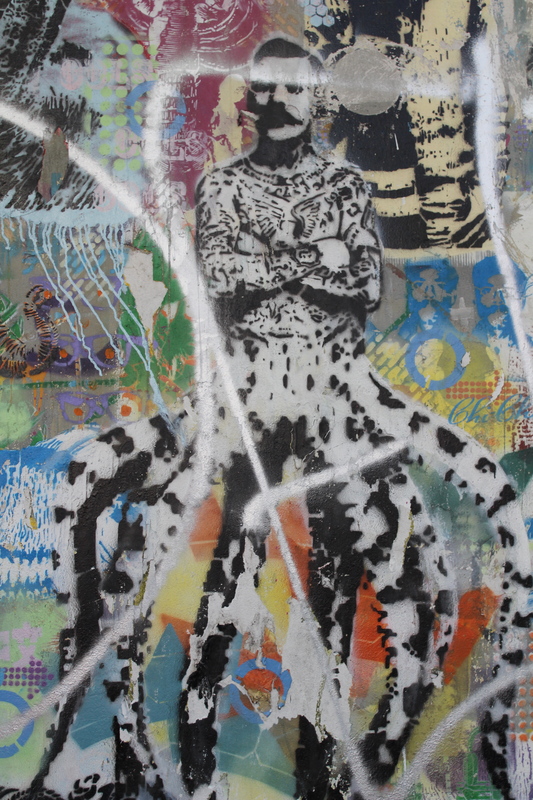 What do materials do the street artists use? 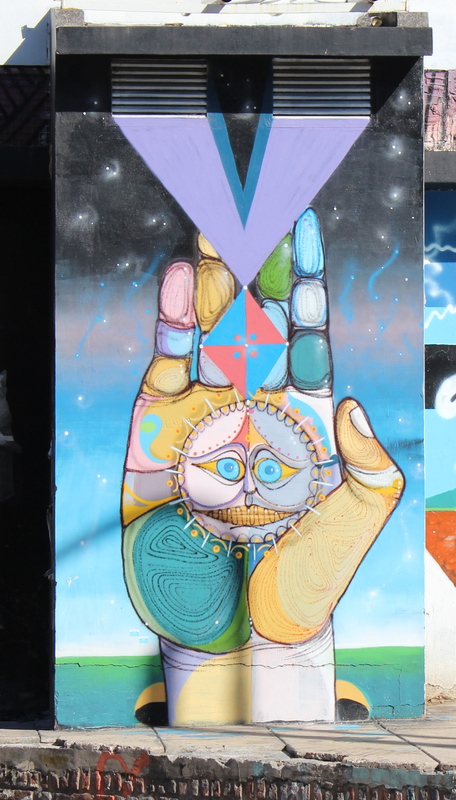 Most of the materials in the street art is acrylic paint, but Jaz was saying he has used tar, gasoline, and other dangerous materials to get the effects he wants but he’s been moving back toward regular acrylic lately. I hope you enjoyed the little street art explanation! 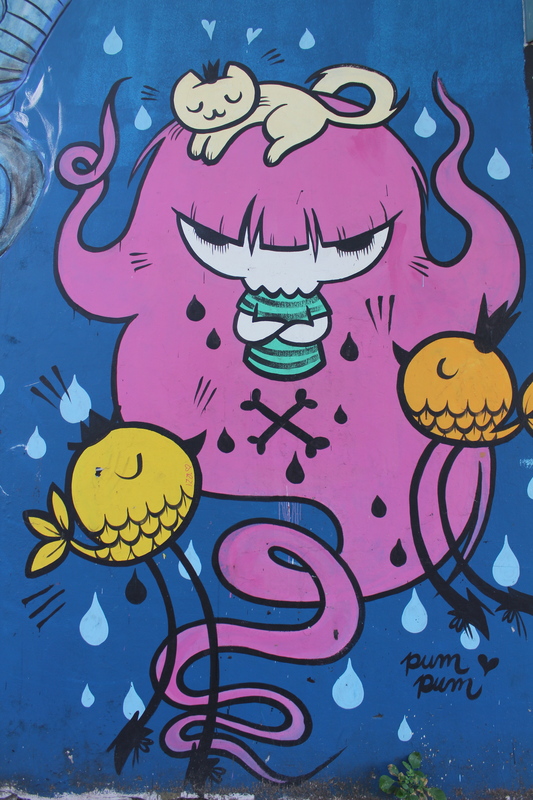 Check out graffitimundo if you have a chance. They also have a facebook page where you can see new art.